Denon announces D-M41DAB stereo system | What Hi-Fi? Denon has just announced a new stereo system, the D-M41DAB. 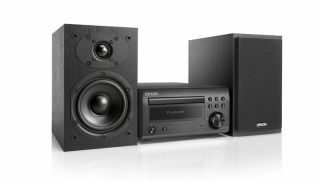 This all-in-one system pairs the RCD-M41DAB CD receiver with SC-M41 speakers. And although it's based on the Denon D-M40DAB, Denon says its engineers have completely reworked the product, both in terms of style and audio circuitry. Hopefully, these are all changes for the better - since we gave the D-M40DAB five stars and several What Hi-Fi Awards, any improvements the company has made will make a fine product even better. The D-M41DAB has Bluetooth connectivity as well as "enhanced sound", apparently, from its CD, DAB/DAB+, FM and digital sources. If you want to connect it an external source, it'll support 24-bit/192kHz audio through either of its two optical digital inputs. It also has a new amplifier circuit, delivering 30W of power to each speaker. If you want to get your hands on it, prices start at £380 - although naturally we recommend waiting for our review first.